I can almost exactly pinpoint what house we pass on the way home when the girls ask, "Can we ride our bikes when we get home?" Mira has taken to wearing her helmet at all times, in an attempt to convince us to let her outside. Poor girl. She puts that thing on, stands at the door, and grunts/cries/yells until someone takes pity and decides that cleaning up the mud will be less miserable than hearing her beg. Once outside, however, she decides she no longer wants the helmet on. Even so, it has come in handy on more than one falling occasion. Maybe 24/7 helmets aren't a bad idea. This week we celebrated Dan's birthday. Ina woke up at 6:15 and as soon as I walked in from the gym she announced that we had to go get birthday donuts. I just had to support her celebratory spirit, so I complied. After work I asked Dan if he would rather get Costco steaks or go out to eat to celebrate. Costco steaks win every single time. Particularly when paired with lava cakes and Blue Bell ice cream. I am trying to teach the girls to enjoy celebrating others' birthdays as much as their own. They did a good job of getting excited, singing Happy Birthday, and giving presents, but when the day ended Cora proclaimed, "Tomorrow, it gets to be MY birthday." Hmph. I guess we need a few more practice rounds. I planned on having a normal work day on Friday, but a few minutes after I walked in the door from dropping the girls off at Danielle's and Ina off at school, Ina's school nurse (who is quickly becoming my most frequent incoming caller), called to say that Ina scratched her eye and needed to be taken to the doctor. After calling her pediatrician, who recommended going to the ER, and quickly deciding to try a local ophthalmologist instead, we had an appointment within 20 minutes and a prescription for an antibiotic eye ointment 20 minutes after that. Having kids has taught me many things, one of which is that you never know how your day is going to go, so always work ahead if possible. Always. On Saturday we took Granny to the zoo and closed the place down. 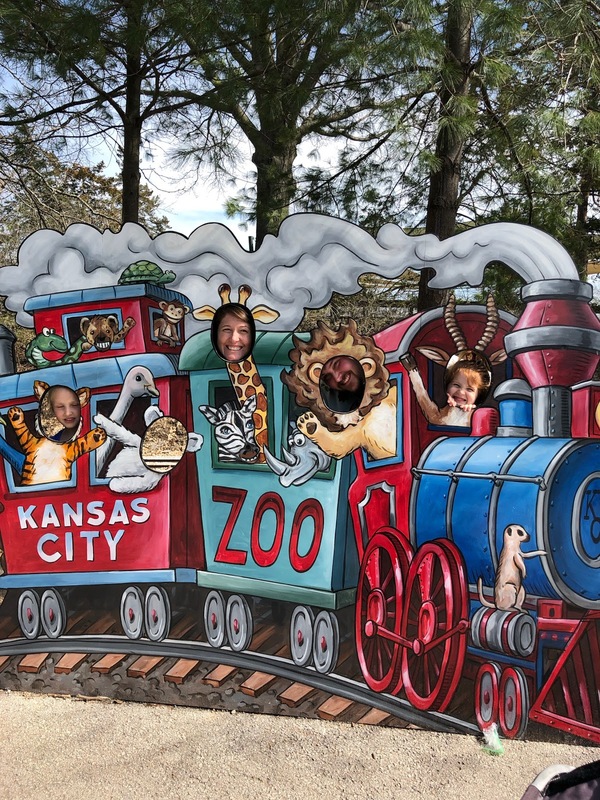 Having been there just a few weeks before, Ina, Cora, and I were the expert tour guides and we loved showing Granny, Dan, and Mira our favorite animals. 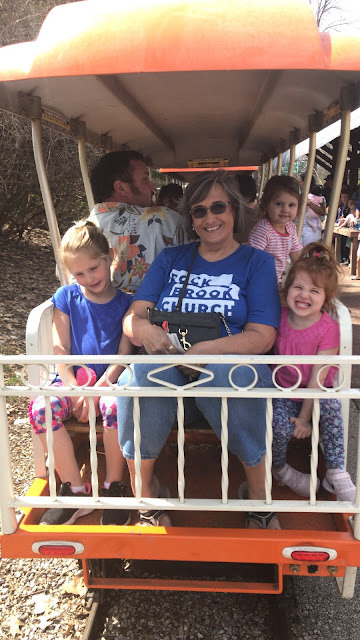 Dan rode the sky tram for the first (and likely last) time, Granny saw her first kangaroo, and Mira was mesmerized by all things that swam in the water - sting rays, penguins, sea otters, etc. Twenty thousand steps later, we were all ready for bed. Sunday flew by with church, then the Nybergs for lunch, then small group, then the Champs for dinner. Our toy room and kitchen were destroyed and cleaned three separate times in 24 hours and I couldn't be happier. China Rich Girlfriend - listening to the sequel was less daunting than reading the first Crazy Rich Asians. I have a bad habit of skimming over words I can't pronounce, which was a good chunk of that book. The third book is downloaded and ready to listen to over the weekend. A Fatal Grace - the second Louise Penny Inspector Gamache book. I read the first one, Still Life, about a year ago but was meh about it. After hearing more raves, I decided to give the books one more try. I haven't finished it yet, so I will report back. Braving the Wilderness: Love me some Brene. Country Captain chicken with roasted brussels sprouts and brown rice - very delicious and unique flavor. Dan did request that I use chicken breasts instead of thighs next time. Cuban sandwiches with french rolls, Parmesan sweet potatoes, and cabbage slaw - strongly recommend this meal. It is already on the menu plan for next week. Monterrey chicken with re"fried" beans and brown rice/quinoa. Another strong recommendation. Cashew chicken lettuce wraps with roasted broccoli - I used this for lunches and was very happy and not guilty at all with my decision to not share with my family.